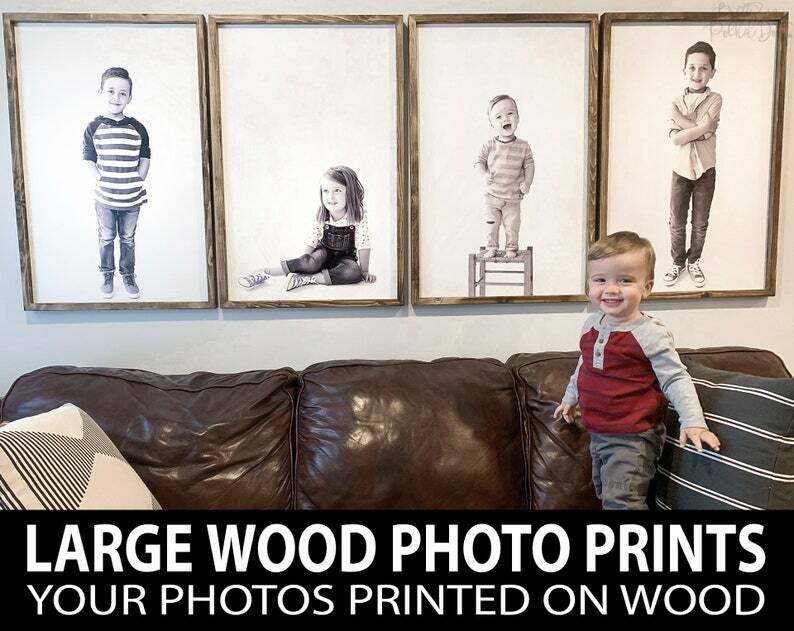 LARGE framed wood photo prints. Have your favorite photos printed on premium birch plywood! This sign includes FREE SHIPPING on domestic orders in the US! - All non-square frames have the option of either horizontal or vertical orientations - must specify when ordering or the best orientation will be chosen for you based on the photo provided. Absolutely love! Beautiful wall piece, timely arrival just as described, and the quality is excellent!! We happily accept all payments accepted through the Etsy checkout process which include: PayPal, Visa, MasterCard, Discover and American Express. We require payment before we begin working any custom designs or digital proof images. WE DO NOT ACCEPT ORDER CANCELLATIONS once we have begun to create your physical product. Any order that is canceled, if the cancellation is accepted by Pretty In Polka Dots, will be refunded minus any costs accrued plus labor charges. Pretty In Polka Dots does not accept returns or exchanges on custom or personalized orders. There are no refunds for custom design fees once paid. Some returns or exchanges may be accepted at the discretion of Pretty In Polka Dots. Restocking fees may apply and return shipping costs are not covered. Please contact Pretty In Polka Dots to see if your purchase is eligible for a return if desired. Tracking Information will be provided for all packages once they have been picked up by the either USPS or UPS. Pretty In Polka Dots is not responsible for undelivered, mis delivered to an incorrect address, or packages that are damaged or destroyed in transit. All Items will ship to the shipping address you provide at checkout. Pretty In Polka Dots is not responsible for mis delivered packages due to an incorrect address nor responsible for making changes to the originally provided shipping information. Duties or other additional fees may apply for some international shipments. We have SOLE OWNERSHIP of any and all designs we create, including Custom Designs. We reserve the right to SHARE any and all designs we create, including Custom Designs, on all social media. We also reserve the right to SELL any and all designs we create, including Custom Designs at any of our brick & mortar locations & our online stores. Pretty In Polka Dots reserves the right to cancel any order for any reason. If order is canceled you will be notified and a full refund to you will be processed.